Kazumune Kenjyu and SD Corporation started the production of wall painting since 1984 aiming at creation of “the artwork suitable to the environment”, “Painting harmonized with environment”, and we have been helping to revitalize the city and local area. “Trick Art Museum” was born as the form of new visual communication through the production of many artworks. We would like the viewers to play in the space of Trick Art and touch directly to the artworks. Furthermore, we generated the new operation and exhibition style that the viewers can take photos freely. As a result, we succeeded to create the whole new culture of art presentation that “You can experience the mysterious art by looking, touching and taking photos. It was renewed the old concept of Art Museum. Trick Art Museum is the new style of museum with the field of vision for worldwide expansion as the futuristic museum. It is worthy to receive the great support from many people as the absolute power of management strategy. SD Corporation is also managing the Trick Art Museum under the direct operation In addition to the planning and development of Trick Art works. 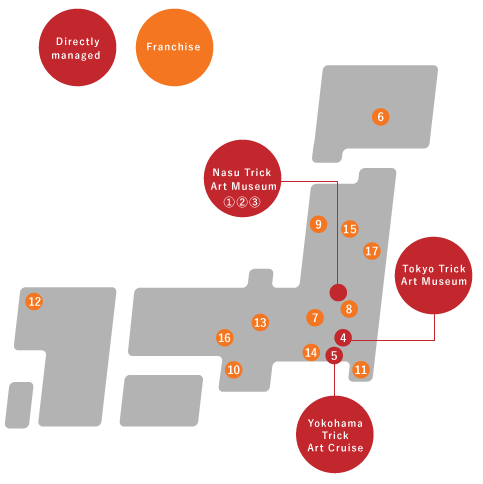 The first Trick Art Museum was opened in Edogawa, Tokyo at the year of 1991 and since then, we opened Trick Art Museum in many places in Japan. Nasu is where our head office is located and Nasu Trick Art Museum is considered to be the origin of Trick Art. -Tokyo Trick Art Museum located in Odaiba, Tokyo opened in July 2011. -Yokohama Trick Art Cruise located in Yokohama, Kanagawa opened in September 2016.
and we are offering the mysterious and unique Trick Art experience to them.